I'll be away for a while: to Germany again for work and some train journeys. 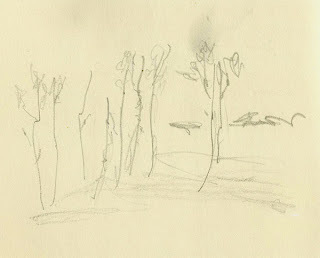 I'll be back end of next week, and leave you with one of my minimalist sketches from December's train journeys. Sixteen of them - in small 10x10 cm to teach my hands how to get to the colours inside my head and outside on the fields. Winter, anyone? Can you find it in there? Where? The squares are either oil bars or oil paints, a couple of them are both. Tell me, which ones are finished? Which ones work for you? Which ones should be taken on further? Funnily, some of the cooler colours I got to with the oil bars - e.g. with emerald green, blue violets and primary blue seem to call winter more easily than yesterday's oil paints. Yet, the texture of the oil paint is just sooo much nicer, I forgot how enjoyable it is to move them around, on the palette, the knive and brush and eventually on canvas, and how they can be worked into again and again. Paintings and works on paper in acrylics, oil and mixed media. St Andrews Building, University of Glasgow. 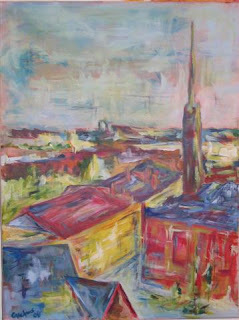 That is what we will do in summer - a group exhibition with my favourite painting group. It looks funny spelled out that way - suddenly there is name. It's been Tom's suggestion: to name after the street where we meet - very traditional. And it's nice to know that Tom had been thinking about this name and this project for a long time before the group constellation became one where a joint exhibition became possible. Today, he brought some fantastic books with font types - he had trained as a graphic designer in London in the 1950s and does the most amazing modernist plays with colour and form. So, contacts are collected, plans are made and all the time, I'm very excited about this. There will be more detail to follow in due course. But the painting above is a first taster. It's the view from our studio space right in the heart of Glasgow's West End. Using the sketchbook much more extensively over the past six months has been really good, not just as source of inspiration but also as a more sustained focus on lines and markmaking with drawing media. The line drawings in December have gone towards addressing my hangups about drawing trees - btw: thank you to all of you who've left such nice comments of late :). This may sound far too woolly and mysterious but I think it's a plan that is only becoming formulated - in the meantime, it'll be about drawing and markmaking - I hope to find something in the way of life classes to help me in this too, but that'll be later on in Spring, I think. So: as a starter a limited palette ink drawing with a bit of collage. And: I had to laugh when I went shopping for my missing oil colours - excited to find the missing essentials I spend a lot of money on: yellow, red and blue - my friend to whom I paraded my acquisitions on Monday did look a bit perplexed about my excitement with these very plain choices. ... for this year (and future ones?) is about oil paint. It's about technique and about taking time to learn things properly. Early last year I had dabbled in oil, but then moved back to pastels and the increasingly mixed media artwork. I'll stick with that as plan 1b (that's the assorted pastels, gouache, acrylics and whatever comes along with it), but for the Saturday mornings up until summer I want to focus on oil painting technique. Subject matter is a bit secondary at the moment, but I must admit that I keep circulating around the Northern Germany winter fields and woods - there's something there that wants a bit more expression - and it isn't homesickness. Yet, by developing a familiar (as well as well-known and comfortable) subject, I'll have more time for the technical explorations. So, first off, there were a few studies with Sennelier oil bars (and some oil pastels on top) - I actually did these back in autumn, but yesterday I took them out for the first time. The first technical bit will be more explicitly about colour mixing - and here I already stumbled over the oil bars - I got 10 or so as a set with a workshop. Yet - of course (and I should have known that before I got excited): other people's colour sets aren't really mine. So: what do I do with primary reds and blues when I got used to cerulean, ultramarine and alizarin crimson? Well: experiment and mix, I suppose. And in the worst case: flog them again. I've got a strong sense where I want to get with those colours - I think that is probably also an advantage of knowing the landscape well - Those earth colours, a lot of umbers, some silvery greens. And yet, my paint tubes don't seem to easily get me there. Small amendments thus include cobalt blue and lemon yellow (no cadmium) as well as a primary (!) red. 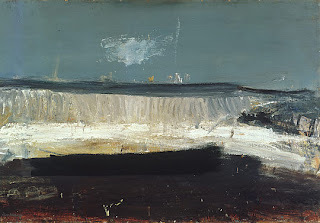 ... skiving a bit this afternoon to get across to Edinburgh... a final time standing amidst those glorious seascapes by Joan Eardley. Besides Spring Tide, there are these two I really like. They hang side by side and yet are so different. Firstly, the Wave - relatively well known it seems so solid - the wave fixed in time above the shoreline. It only starts to move with plenty of distance - from the far end of the large room - between it and myself. But then it does move. But then I can almost hear it breaking on the shore. Beside it, some spray: Foam and Blue Sky - gusts of seawater and salt in one's face. So much movement, close up and immediate, maybe even more so since the wave next to seemed fixed in eternity. Still leafing through my sketchbook from late December, here are a few ink drawings of trees. They are life drawings, so to speak: trying to observe closely while still trying to capture something of the trees' anatomy. Some royal blue ink and a thick bamboo nib were my treats on my last visit to the art shop before I had left Glasgow. There is something so definite about ink - unlike pencil and graphite - that makes it exciting to experiment with. No ability to erase but only to rework. The end of the previous post on lines and compositions was introducing some of the colours of those wintery fields, woods and grasses. In summer I had begun to notice more clearly different landscape palettes - notably Scottish summer colours and how they changed from the colours of the Negev desert in Spring. So, now onto Northern German winters... noticing the changing colours and the factors that make up those colours such as low sun, bare trees and fields, cold temperatures and so on has been one of the exciting moments of beginning to paint: suddenly everything around me takes on all these variations and changes in colours: tone, hue, value and chroma and blue stops being just blue but becomes much more than that. Enough talking... I only took a few oilies and my watersoluble neopastels with me - for both I just need very few sticks to be able to mix without water. I did a couple of test patches of where my colours would get me. Nothing fancy but useful nonetheless. The haziness above a bare field (at start of the post); but also the variations of some lush greens, ochres and yellows of different fields, meadows and the tracks beside them. Lastly: the silvery greens of conifers intermixed with just a hint of heather purple - and their variations. And: as a wave to other people's recent blog posts on colour - including some very good suggestions for sketching, see Lindsay's post here and Penelope's here. Oh, and seeing that it's post no 1 in 2008: Have a very good new year!